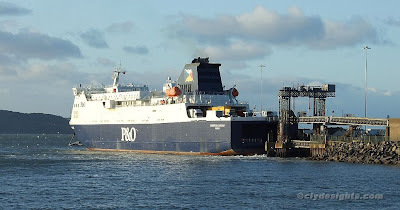 The other operator using Loch Ryan is P&O Irish Sea, who run two sisterships between Cairnryan and Larne. EUROPEAN CAUSEWAY was built by Mitsubishi in Japan in 2000 and was joined two years later by the almost identical EUROPEAN HIGHLANDER. This crossing is also served during the summer months by the fast craft EXPRESS, now laid up for the winter months. The P&O ships provide an intensive service, each making three or four return crossings every day. EUROPEAN CAUSEWAY is 159.5 metres in length, with a deadweight of 4,276 tonnes and is 20,646 gross tons. She can carry 410 passengers and up to 315 cars, or a maximum of 84 15m freight units. Very nice, good day for a wee dander although a wee bit chilly ! !